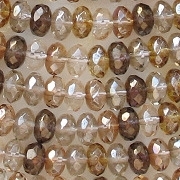 4mm (hole to hole) x 7mm (wide) faceted rondelles. Rondelles are any round bead which is wider than it is long. 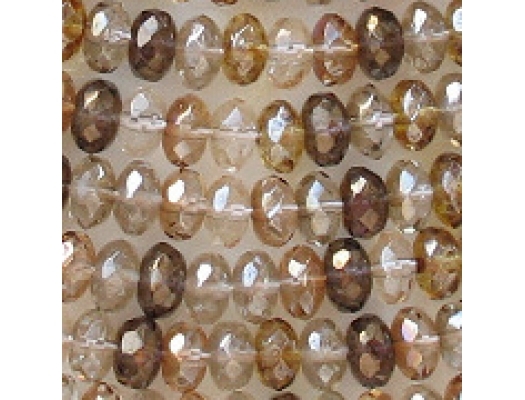 A mixture of translucent brown, beige and clear beads with luster and celsian coatings. Celsian coatings are gold or golden brown. The coatings are made of glass and then fire-polished onto the beads. I haven't noticed any significant defects. 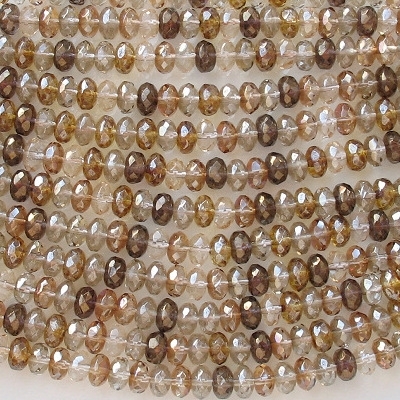 However, fire-polished beads always have some imperfect facets. This is a pretty mix. I restocked it in June, 2011 not realizing that the supplier's price went up considerably, so I had to raise my price. Sorry!